Today, their celebration concluded with a panel discussion among nine women from diverse backgrounds and professions. Many of the professionals are first-generation college students and each are women of color, which mirrors the demographics of the students at KIPP Corazón, who are 97% Latinx. Professions varied from medicine to engineering to education to finance. Michelle Torres, KIPP Corazón's English language arts teacher, coordinated the panel called Celebrating Herstory. Her goal was to have each of the panelists share "how their gender affects their interactions in the work space and the barriers that they had to overcome due to stereotypes women have in these different fields or lack of representation." One panelist, Eunice Hernandez, shared with the students that after struggling in college she realized that "all I needed to do was believe in myself." 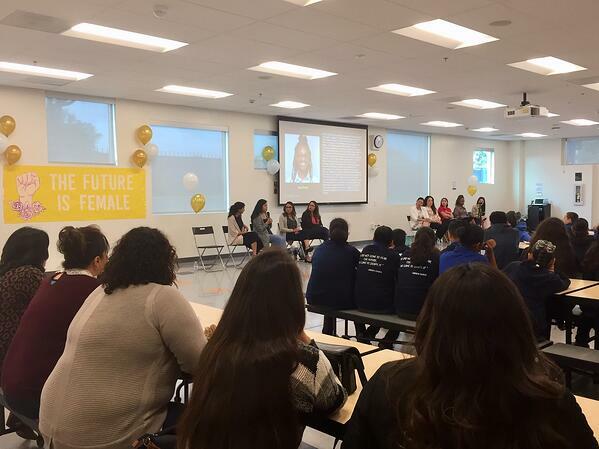 Students were highly engaged in the two-hour event, which delved into critical topics like racism, culture shock, self-confidence issues, and the importance of STEM education for girls. Maylie, KIPP Corazón's fifth-grade student president, noted that "what brought us all here today are these empowering women of color who have embodied our KIPP Corazón values of pride, curiosity, advocacy, and purpose." It is clear after today's event that the future is indeed female!